Come join me this Spring for these free library workshops. Learn how to optimize your health and mood! This workshop explores the effects of food on your mood and vice versa. You will gain a better understanding of your food cravings, learn about important nutrients, and be able to identify which nutrient-dense foods best improve mood. I’m bringing back my most popular workshop for Mother’s Day! Come understand why posture is important and how it affects our daily living. We will begin with a self-assessment of your posture and focus on certain exercises to improve posture from your head to your toes. You can get a preview of these exercises here. This session will be interactive and involve movement so please wear comfortable clothing. You can also read more about posture here. Are you feeling overwhelmed with work or home life? Do you have a hard time juggling various activities in your life? This workshop will explore how you spend your time now as well as reflect upon activities that bring you meaning. We will discuss the four most important metrics for a successful life and you will discover what actions will need to be taken in order to create a personal work-life balance. If you come to World Taichi Day and want more or if you aren’t able to attend World Taichi Day, I will be giving this popular Intro to Taichi workshop on the same weekend. It’s that time of year again when we celebrate WORLD TAICHI DAY with others in the community and around the world! All are welcome, regardless of age or ability! Please wear loose, comfortable clothing for all activities. 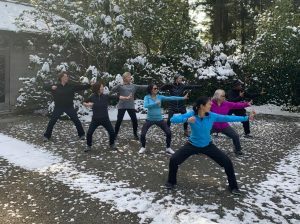 10am-12n FREE Taichi/Qigong class at Pacific Bonsai Museum in Federal Way, WA. Click here for more information and directions. Do you hear a lot about mindfulness and wonder what it is? Do you struggle with being mindful in your life? In this workshop, we will go over the importance of mindfulness as well as its attitudinal foundations. We will put them into practice with a few exercises to help you integrate mindfulness into your life. This is a participatory workshop so please come with an open mind and curiosity!